Best Price Offers till the end of February!! Day 1: Flight to Kayseri(Cappadocia in the morning). Accommodation in cave hotel in Cappadocia. Dia 2: Breakfast at the hotel. Please See Below for Pricing and Other Details! Pride Travel Turkey as always keeps offering you the best seller Cappadocia tours from Istanbul and one of the most prefferred itineraries by our guests is the package of 2 days Cappadocia tour from Istanbul; round trip by plane with 1 night cave hotel accommodation and 2 full days English-speaking guided tour programmes with entrances' fees and lunch! 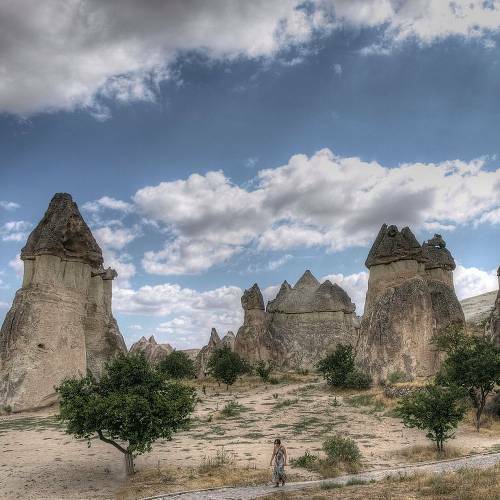 At the end of this package, in 2 days only, you will have visited the most important monuments of Cappadocia and will have discovered the grand part of Northern and Southern Cappadocia with all the important museums, underground cities and valleys of the beautiful town and you will not only get to know the sites in Ürgüp and Goreme but also will able to participate in the hot air balloon flight activity to leave Cappadocia with unforgettable memories! For this tour package we offer guarantee departure from Istanbul every day all year long. 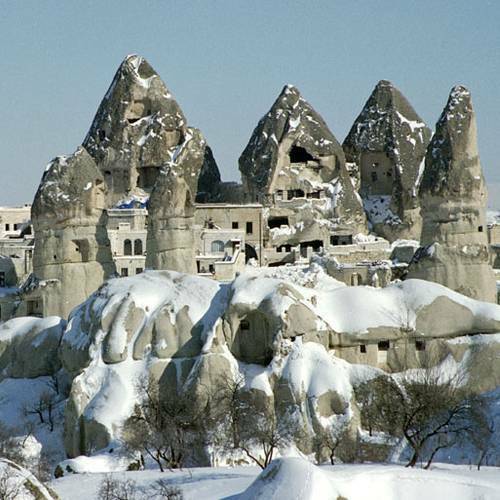 The landscape of Cappadocia has a unique beauty both in summer and winter.. Pick up from your hotel in Istanbul around 05.00 in the morning for the transfer to the airport. Take flight to Kayseri at 07.00 a.m. on Turkish Airlines. Arrival at Kayseri at 08.10 and pick up at the airport for direct transfer to the tour area in Cappadocia. -Uchisar Lunch is included in the tour . 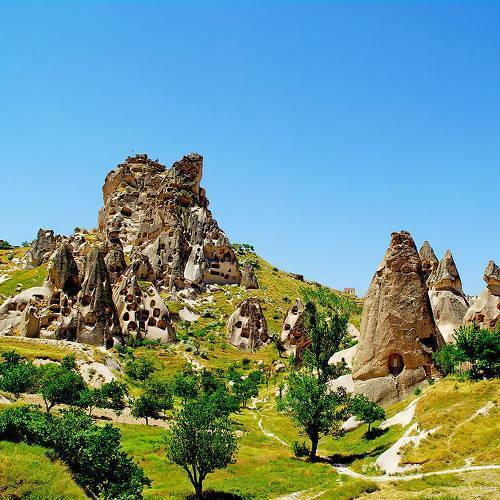 At the end of the excursion, we will take you to the cave hotel in Cappadocia – around 5pm in the afternoon. Breakfast is included in the accommodation. After breakfast, pick up at the hotel and departure for the excursion. Start the tour in the South of Cappadocia around 10.00 in the morning. THE PLACES WE WILL VISIT ARE THE FOLLOWING ones ; -Kizilcukur -Cavusin -Valle de Imaginacion -The Underground City of Kaymakli -The house- The Valley of Doves Lunch is included in the tour . On arrival in Istanbul at 20.55, pick up at the airport and transfer to your hotel. Remember that for those who are interested in upgrading the hotel category even more, it is possible to pick up a more luxury hotel by paying the difference . NOTA: Remember that the prices may differ for last minute reservations due to the availability of flights. But we try to keep the regular prices as much as possible! Click Here For Booking NOW! 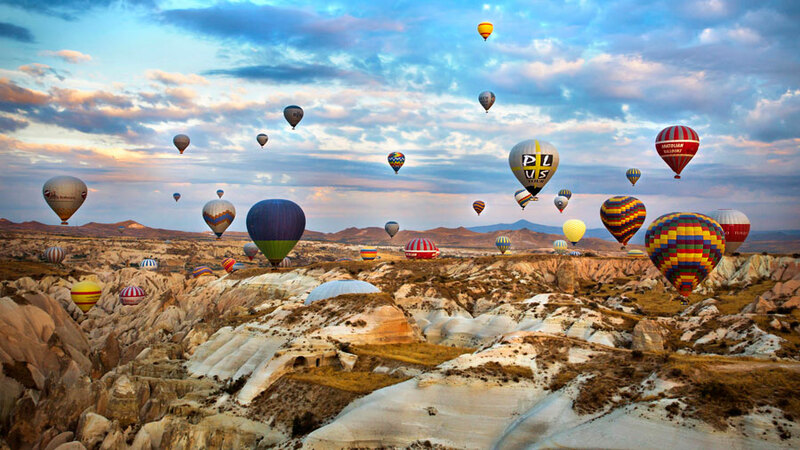 Please remember sending us the date that you plan to travel from Istanbul to Cappadocia! Write Us NOW for Bookings or Other Inquieries! Alternatively you can add us to your whatsapp contacts! HOT AIR BALLOON RIDE in CAPPADOCIA can be done the second day in Cappadocia, early in the morning before the time of the start of the tour in the South of Cappadocia. The flight is for a whole hour and by taking it, you do not miss any part of the daily tour as it is done very early and you go back to the hotel even before breakfast. Prices vary a lot depending on the balloon company. We work with a company that is quite professional, has professional pilots and a high quality service and in the meantime has reasonable prices. The itineraries listed above are customizable and can be adjusted according to your needs. We can add more days in Capadoc, to change the flight time, etc. All tours start at your hotel in Istanbul but accommodation in Istanbul are NOT included in the circuits. According to your request, you can arrange accommodation and additional excursions in Istanbul before you start or at the end of the tour. All excursions are guided in Spanish with official certificate from the Ministry of Tourism. The transports that are used are a new model and the drivers are professionals. The hotels used in our packages are of 3-4 star quality and if you book well in advance it is possible to choose the hotel in Capadocia. 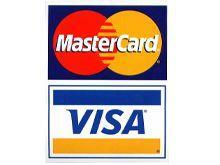 It is also possible to raise the category of hotels with the condition of paying the difference in price. From time to time, to arrange the personalized itinerary or in the high season to cover the costs of the excursion, flights departing from the Sabiha Gokcen airport are used. In such cases, we would inform you in advance. The official hotel check-in time is after 2:00 pm but we will leave your luggage at the hotel first or we will keep it safely in our tour buses during your trip in Cappadocia and our local office in Capadocia is a home office where There is a bathroom to use before going out to the excursion.